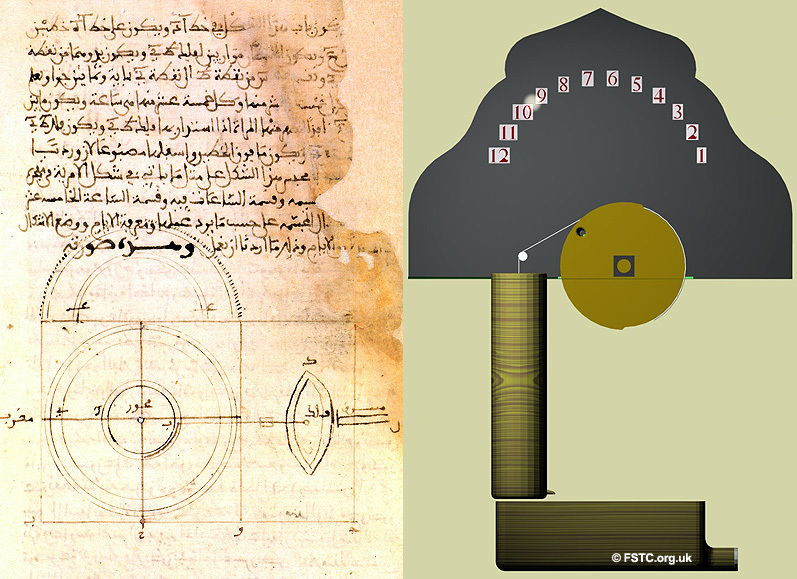 TIME TELLING MACHINES: Revealing marvellous mechanical and water-powered clocks from early Muslim Civilisation. 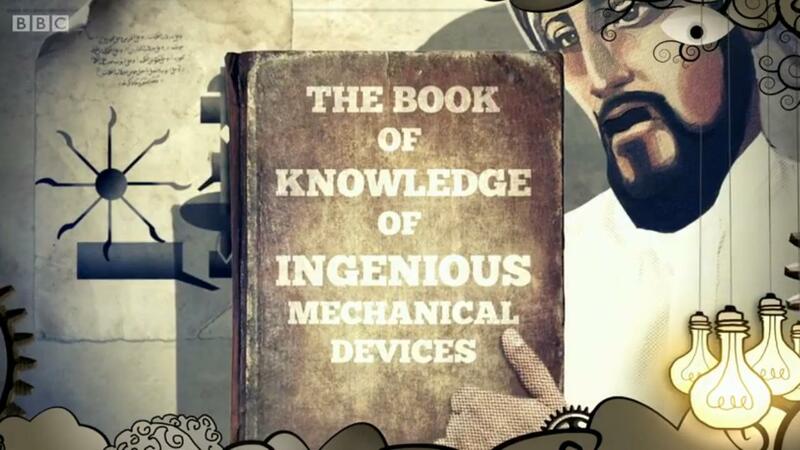 These sophisticated devices that defied the Middle Ages. 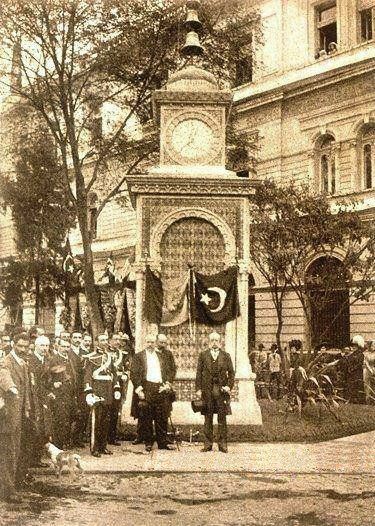 Clocks and timekeeping were one of the most significant developments of Muslim civilisation. 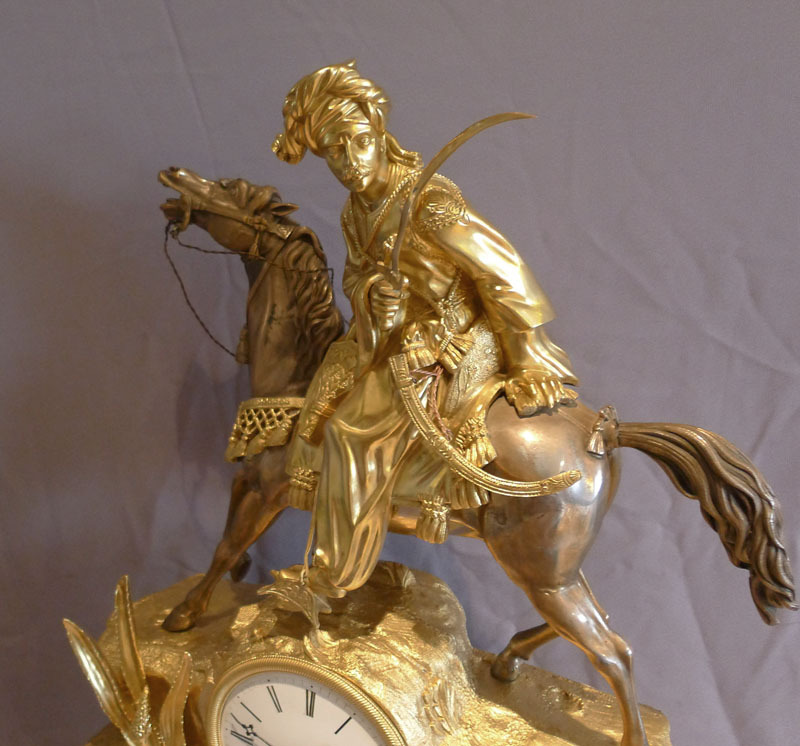 Scholars, inventors and craftsmen made innovative automata, carried out detailed mathematical analysis, constructed intricate clocks and attempted to master automatic control as they created and expanded upon inventions to mark and measure time. Introduction to the History of Science Vol.11 Part II by George Sarton, Baltimore, William and Wilkins company, 1931, p.632. This may be the earliest record of clocks in Muslim Civilisation history. However, the quote itself shows that the usage of clocks was a common practice in and before 9th Century – maybe even the making of clocks. Clock-makers from Muslim Civilisation indeed, used Indian and Greek technology. Though Archimedes book on the water-clocks was not just preserved in Arabic – advancement and the creativity in building clocks became a form of art like the astrolabes. This also contributed towards the development in automata and other technological advancements. . 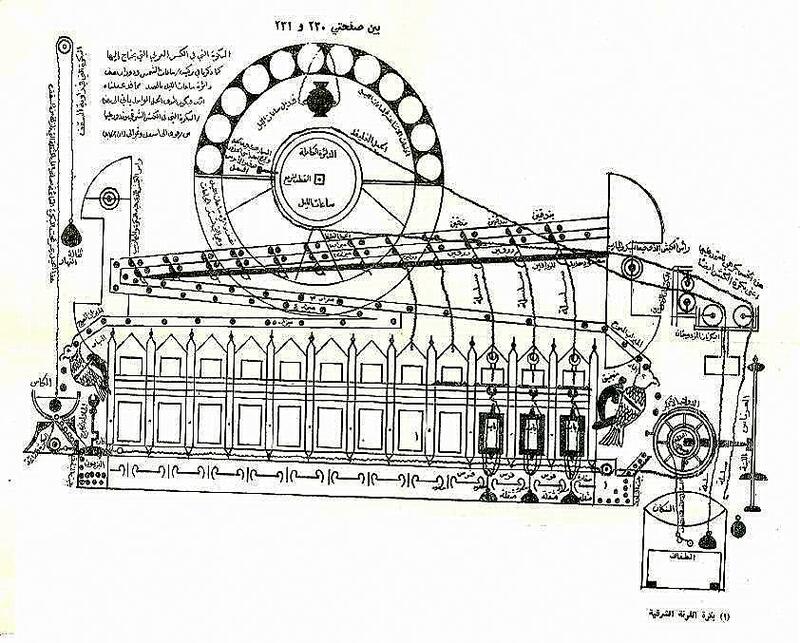 The first machine described by Al-Jazari in his famous treatise of mechanics Al-Jami‘ bayn al-‘ilm wa ‘l-‘amal al-nafi‘ fi sina‘at al-hiyal (‘A Compendium on the Theory and Useful Practice of the Mechanical Arts’) is a monumental water clock known as the Castle Clock. 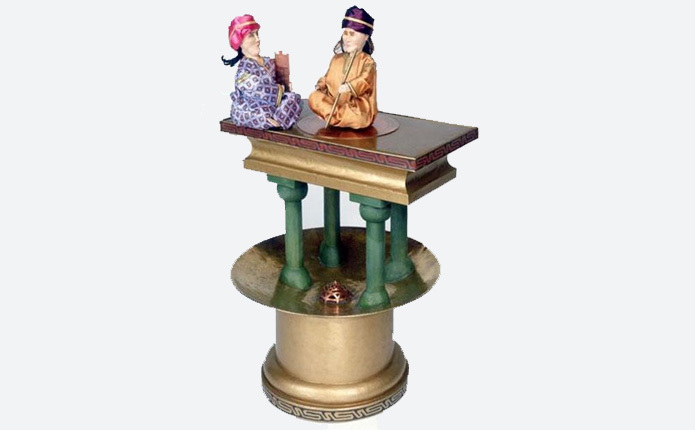 The castle water clock is one of the grandest clocks mentioned in Al-Jazari’s book. Details of its construction and operation are described in ten sections of the first chapter of Category I of the treatise. The clock, with its series of mechanical routines that ran throughout the day, would have been very pleasing to watch and listen to. During daylight hours, an observer would have seen the Sun’s disc on the eastern horizon about to rise, the Moon would not be seen at all and six zodiac signs would be visible, while the first point of the constellation Libra was about to set. Originally built in the famous Umayyad mosque in Damacus more than 800 years ago, this clock was re-constructed by Ridhwan al-Sa’ati. This impressive mechanical clock displayed the time numerically, and included two falcons that would automatically throw a copper ball into a vase to mark the passing of an hour. At night, a lamp would be lit to indicate the hour by shining through a turning disc. 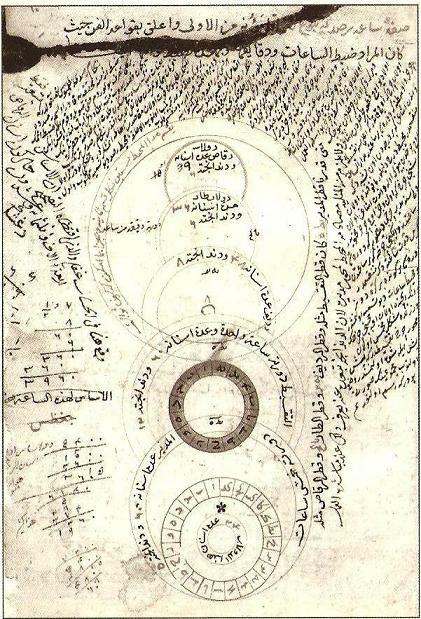 Figure 6.The general plan of the Umayyad mosque water clock as drafted by Ridhwan al-Sa’ati in his original manuscript. 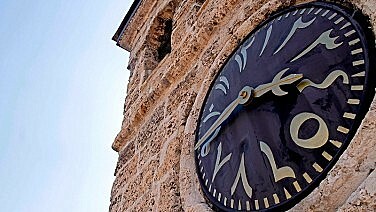 According to descriptions by Ibn Jubayr, geographer, traveler and poet from al-Andalus (Muslim Spain), the clock had both an upper level and a lower section. The lower section housed the engine that generated the movements and transmitted them by ropes and pulleys to the upper part. The engine worked by means of a float in a water tank (bankan). Upon draining the water from the tank, through an orifice at the bottom, the float moved down under the force of gravity, pulling a rope over a pulley which caused the movement of all the other parts. The float movement was controlled by the speed with which the water surface moved down in itself regulated by a control valve attached to the orifice. 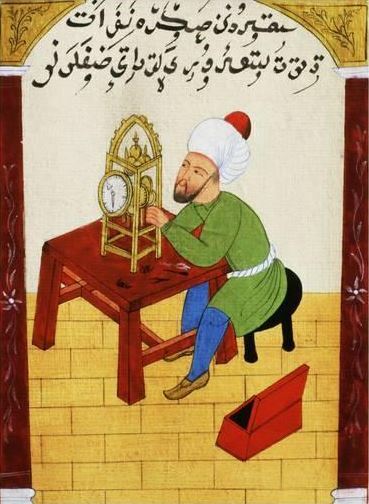 In his book ‘The Brightest Stars for the Construction of Mechanical Clocks’ (Al-Kawakib al-durriyya fi wadh’ al-bankamat al-dawriyya), Taqi al-Din Ibn Ma’ruf analyses the four main types of time keeping devices known in the 16th century: watches, domestic clocks, astronomical clocks and tower clocks. Such machines represent the earliest mechanical computers. Before the 16th century, clocks were considered too inaccurate for measuring celestial movements. Where Ptolemy failed to succeed in, Taqī al-Dīn planned to build an astronomical clock that would measure time with great regularity in fulfillment of the wish of the Sultan at the time. Using mathematics, he designed three dials which showed the hours, degrees and minutes. 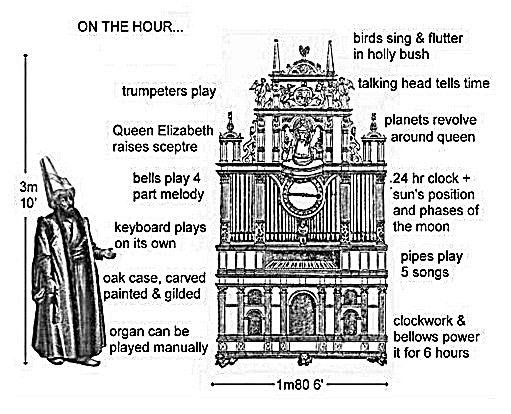 In his clock, he incorporated the use of several escapements, an alarm, the striking trains that sounded at every hour, the visual relationship between the sun and the moon, the different phases of the moon, the devices that indicated the time for prayers and the dials that showed the first day of the Gregorian months. 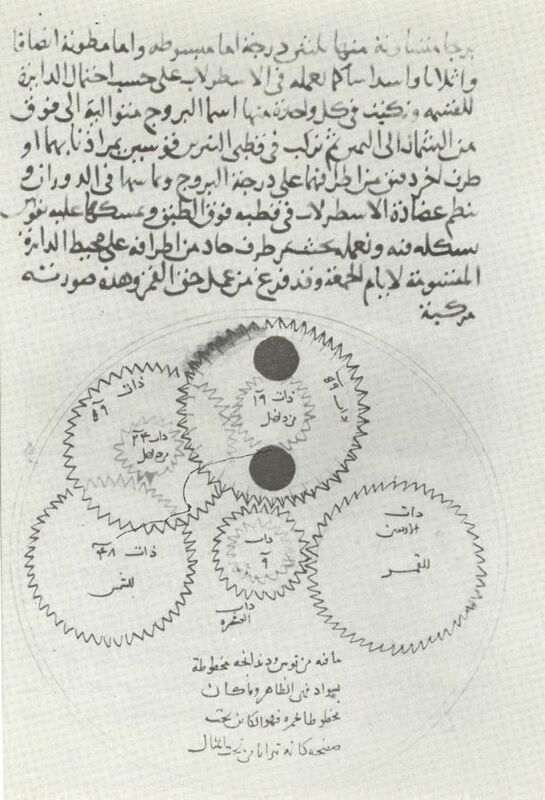 Taqī al-Dīn’s work on mechanical clocks is of important significance in light of transmission of knowledge between cultures and advancement of technology within the Middle East in the middle of the 16th century. 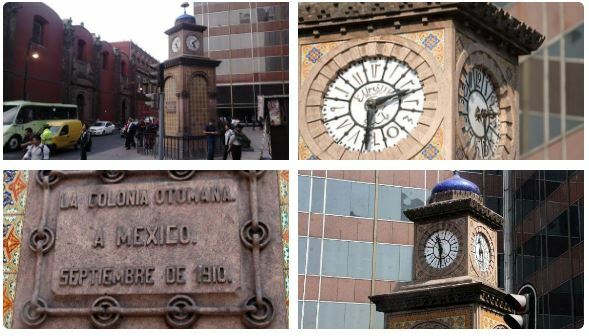 Many of the devices mentioned in his clock are present in today’s clocks from all around the world. 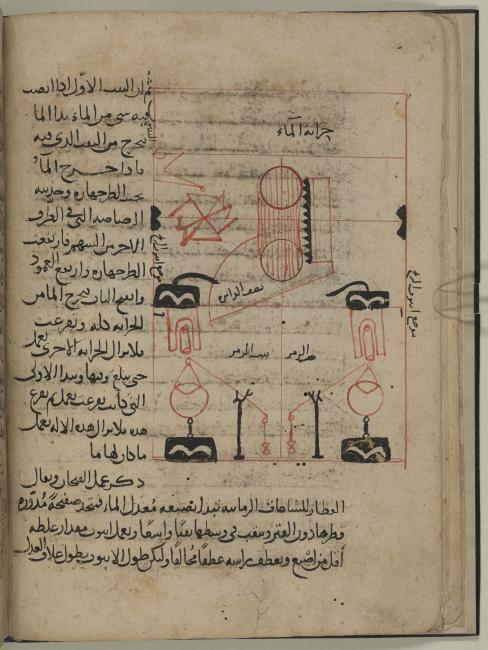 Some of the earliest descriptions in Arabic of water clocks are available in Al-Muradi’s ‘The Book of Secrets’, there has been found some of the earliest descriptions in Arabic of water clocks. This book deals with water clocks and other devices that use automata. 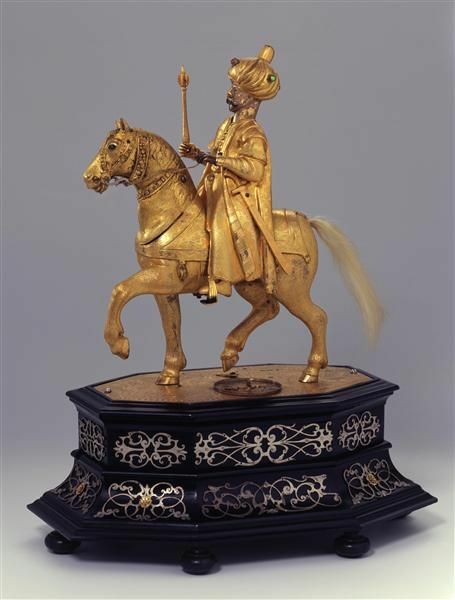 The treatise consists of 31 models of which five are essentially very large toys similar to clocks, in that automata are caused to move at intervals, but without precise timing. 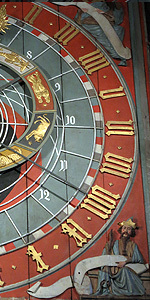 There are nineteen clocks all of which record the passage of the temporal hours by the movements of automata. The power came from flowing water, and it was transmitted to automata by very sophisticated mechanisms, which included gears and the use of mercury. These are highly significant features; they provide the first known examples of complex gearing used to transmit high torque, while the adoption of mercury reappears in European clocks from the thirteenth century onwards. Unfortunately, the only known manuscript of this work is badly defaced and it is not possible to understand exactly how the clocks worked. A weight-driven clock with a mercury escapement appears in “Libros del Saber”, a work written in Spanish at the court of Alfonso of Castille in about 1277 and consisting of translations and paraphrases of Arabic works. A novel feature in this treatise is the use of mercury in balances. Al-Zarquali built two large water clocks on the banks of the river Tagus at Toledo in 11th century. 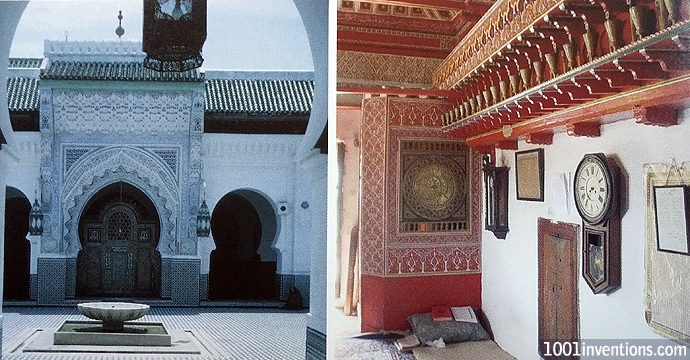 Amongst the most remarkable historical objects in the Maghrib are the clocks in Fez in Morocco. One of these, a water clock operated by levers and strings and without any complicated gear mechanisms, was located in a room in the minaret of the Qarawiyyin Mosque. 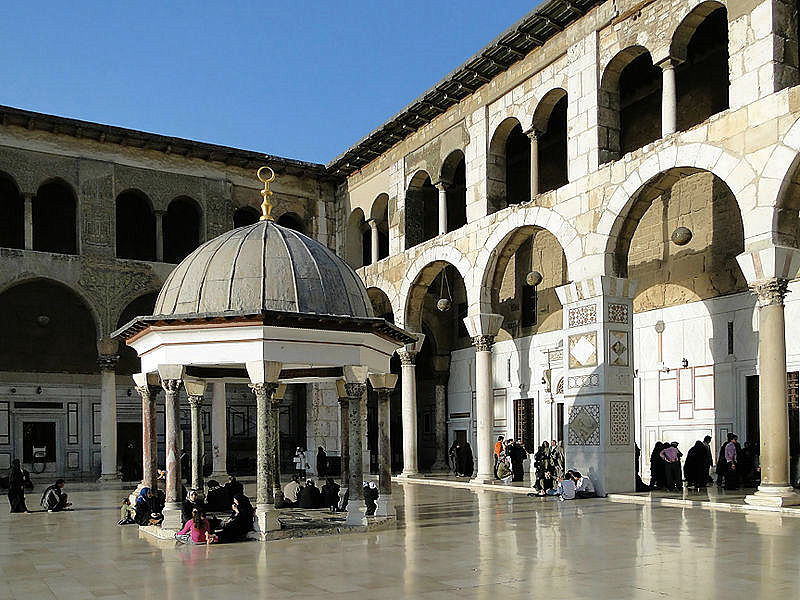 It was made in 1286/87 by Ibn al-Habbak al-Tilimsani, and when it was restored in 1346-48 by Abu Abdallah al-‘Arabi it was fitted with an astrolabic rete to help track the stars. Alas, the driving mechanism behind the clock is lost without trace, and it is not clear what changes have been made to the front of the clock. But fortunately the astrolabic part survives to this day. It is housed in a cabinet 2.4 metres high and 1.2 metres square; the rete is about 40 cm in diameter, and would have rotated once every 24 hours. It thus could imitate the apparent daily rotation of the heavens about the horizon of Fez, a kind of model of the universe in two dimensions. In addition, metal balls would fall through the doors above the clock every hour . The muwaqqit was the officer charged with the regulation and maintenance of the clocks and with communicating the correct times of prayer to the muezzin who would lead the call to prayer. 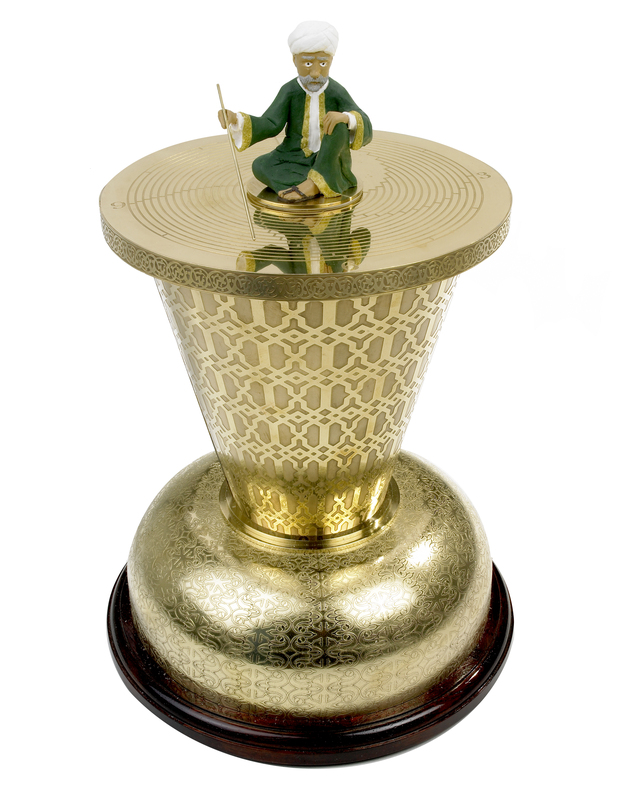 The most important object of the Dar al-Muwaqqit is the water clock of Al-Lija’i made at the order of the Marinid Sultan Abu Salim Ali II (r. 1359-1361) by Abu Zaid Abdurrahman Ibn Suleyman al-Lija’i (d. 1370). 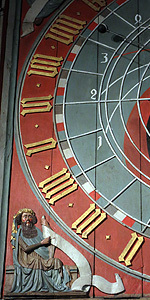 Notice the 12 doors under and above the disk; the red wooden structure is the top part of the clock. Source: La clepsydre Al-Lijai. Better known for his ground-breaking discoveries in optics, Ibn al-Haytham’s work on the water clock (Maqala fi ‘amal al-binkam) is also very significant. In his writings, Ibn al-Haytham gives details of the water clock. He describes it as a new invention in that it gives hours and minutes, which no other clockhad previously shown. He refers to making and manufacturing the clock, as well as testing it by trial and error. The time-measuring mechanism he used was a cylinder with a small hole at its base as the prime mover for telling the time. As the cylinder sank downwards into another tank, which contained sufficient amount of water, it resembleed an inflow clepsydra, measuring time by the amount of water that had flowed in. This was unlike the clepsydras used in antiquity, which were later adapted by Muslim engineers Al-Muradi, Ibn Ridhwan al-Sa’ati and Al-Jazari. These were all outflow clepsydras, measuring time by the amount of water that had flown out. It is interesting that Ibn al-Haytham should use inflow technology for the control of his clock instead of the outflow clepsydra, which should have been well known in Cairo at the time when he was in Egypt. 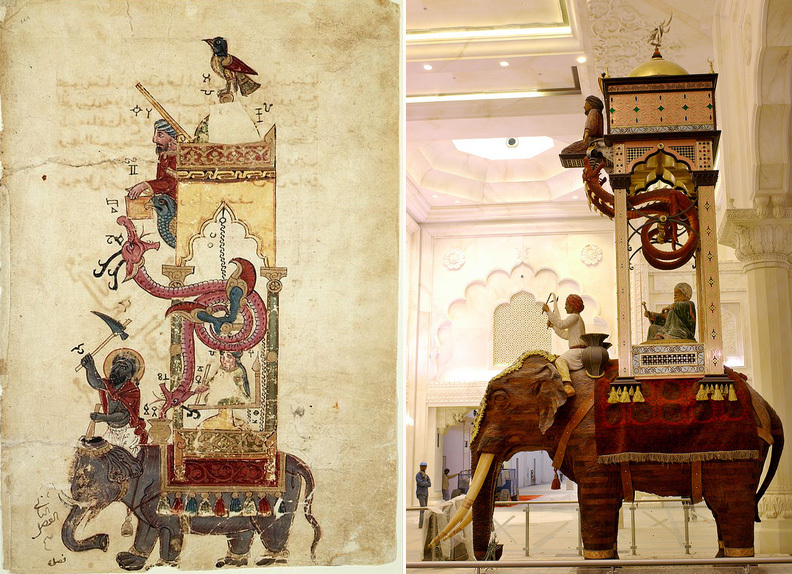 Al-Jazari’s 800-year-old automatic Elephant Clock is probably the most famous of clocks from Muslim civilisation. 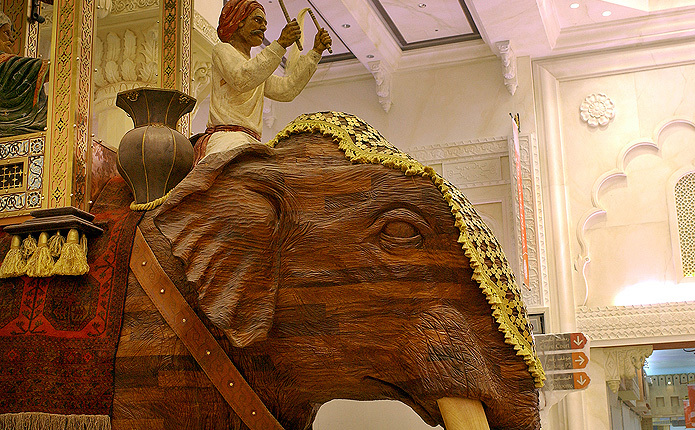 The large clock uses Greek water-raising technology, an Indian elephant, an Egyptian phoenix, Arabian figures and Chinese dragons, to celebrate the diversity of the world. 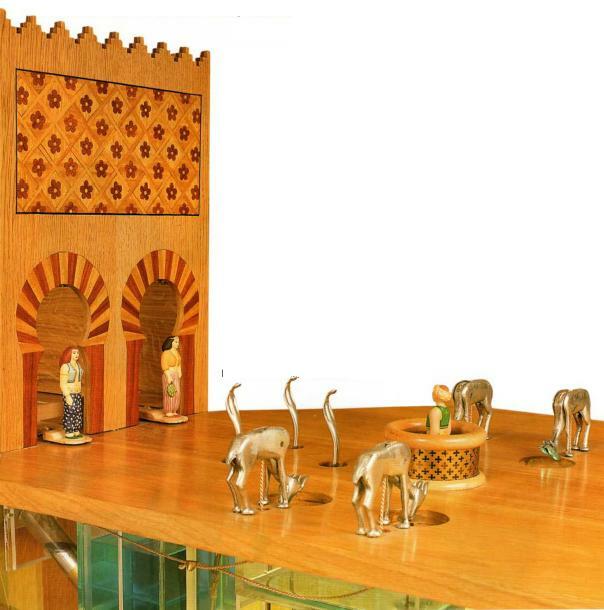 The Role of Automata in the History of Technology; in Technology and Culture Vol 5 by S A Bedini pp 24-42; at p. 29. Engineering in the Encyclopaedia by Donald R. Hill (Rashed ed), op cit, pp. 751-95; at p. 786. This can easily be verified by comparing both traditions, the Greek and the Muslim to realise, indeed, that the latter bears the strongest affinities with modern technology, with respect to every single device. A valuable recent article by Aiken on the impact of Al-Jazari (fl. 1206) goes a long way to prove this point. 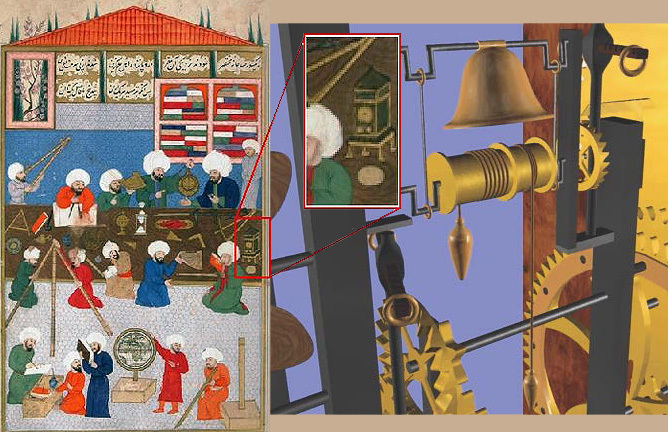 The ingenious complexity of his devices, as well as his desire to instruct followers in the art and science of making them, Aiken points out, compelled al-Jazari to provide more detailed written descriptions of their inner workings than those found in any known older treatise. The instructive value of al-Jazari’s innovative drawings are obvious when compared to the typically more abbreviated illustrations found in a 13th century copy of Hero of Alexandria’s Pneumatica of the first century. As one might expect not only does Hero hardly mention the manufacturing process in the text of his treatise, he never explains how to construct any part of the machine, no matter how critical. By contrast, al-Jazari’s text and illustrations represent the growing importance and status of mechanical arts in the Middle Ages as well as their association with the most sweeping kinds of earthly, philosophical, and cosmological order. 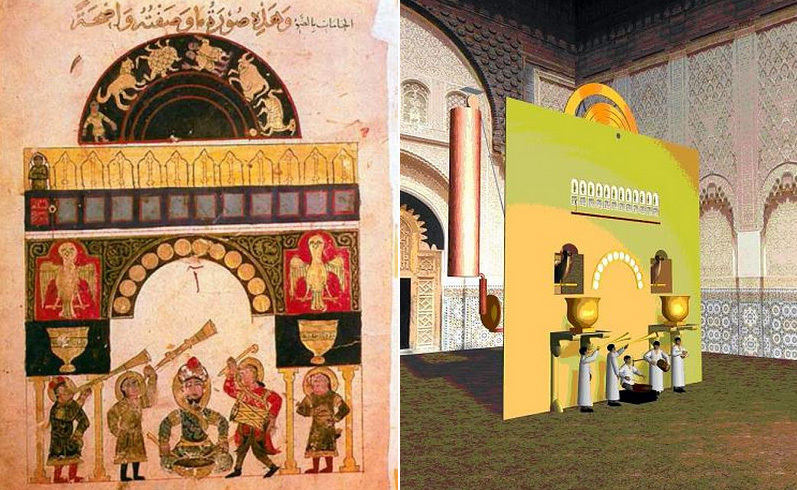 Truth in images from the technical drawings of al-Jazari by J A Aiken, Campanus of Novara, 1994; pp. 325-359; at p. 344. *From “The Hidden Debt to Islamic Civilisation, Volume II” by Al-Djazairi, S.E..
“In the second passage from Rev. Kenner Davenport’s The Reasonable Horologist, he reflects on man’s early attempts to capture time more precisely. Clepsydra refers to a water clock (its Greek translation is “water thief”) which measures time by regulating the flow of liquid from one vessel to another. Figure 26. 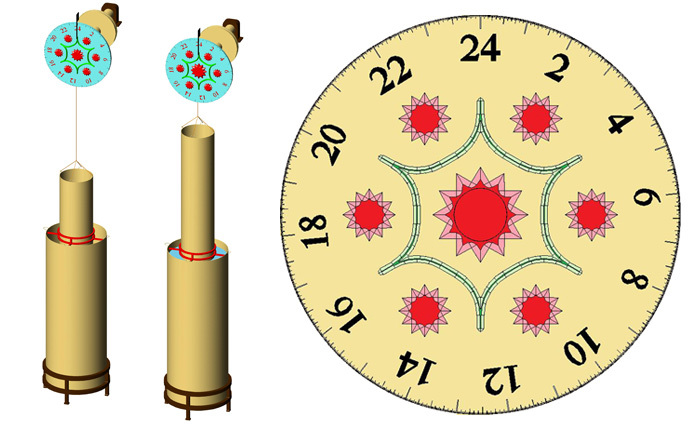 Reconstruction of the clock of Al-Muradi by Spanish scholars. A general view with its side opening revealing the working of the mechanism. 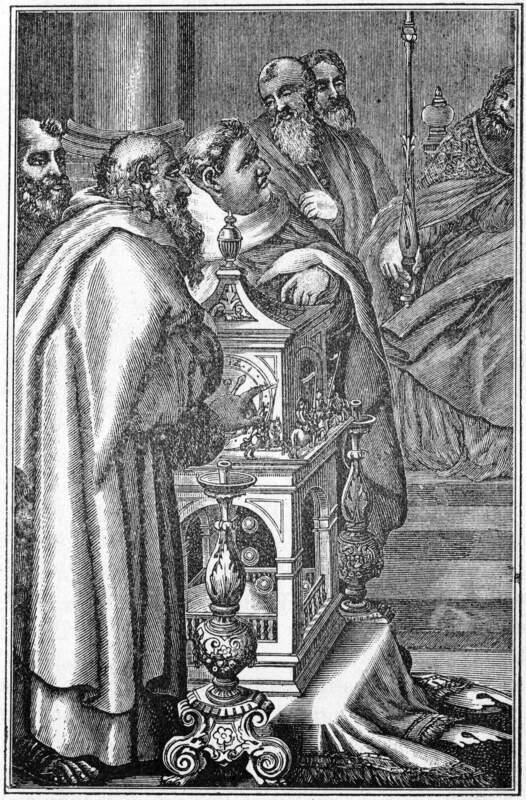 Source: Eduard Farré Olivé , De Mensura Temporis. (1ª parte) “Arte y Hora” n. 123-H6, March-April 1997, pp. 8-16 (2ª parte) “Arte y Hora” n. 127-H10, January-February 1998, pp. 10-17; and Eduard Farré Olivé, La clepsidra de las Gacelas del manuscrito de relojes de Al-Muradi. Figure 33. 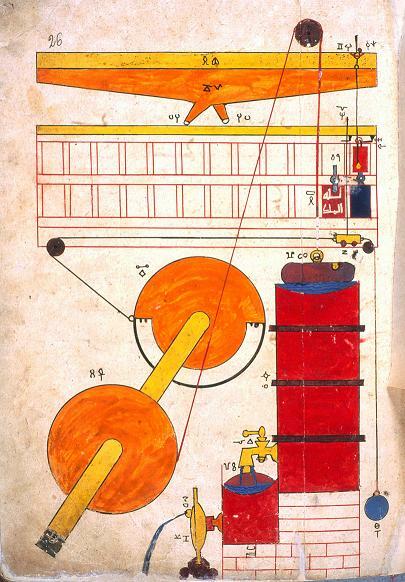 Al-Biruni’s Mechanical Calendar (British Library, MS OR 5593). Figure 39. 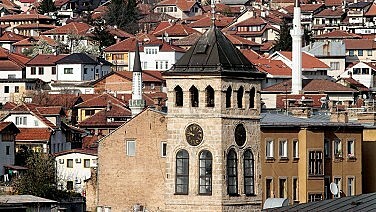 Front view, Sarajevo clock tower. (Source). Figure 40. Close up of the Ottoman clock dial which still displays Arabic numerals (Source).